SAA Flights to India quality to earn exclusive Southafrica.to travel vouchers. Send your writeup to cheapflights@southafrica.to and we'll send you travel vouchers. Photos earn more. SAA was the only airline that operated direct flights from South Africa to India. The airline operated daily flights from Johannesburg to Mumbai (reduced to 6 flights a week as from 1 July 2014), usually in A330-200s. The route has been cancelled because of the massive losses that it was reporting every year. The flights will now be redirected to Abu Dhabi where SAA will use its codeshare with Etihad Airways to fly the passengers to India. 4 February 2015 - SAA has cancelled their direct flights to India effective April 1, 2015. The airline will redirect its flights to all Indian destinations via Abu Dhabi. This will be done through its new direct service to Abu Dhabi and code-sharing agreement with Jet and Etihad Airways into the sub-continent. SAA has changed the planes that it flies with on the JNB to Mumbai flight route with its A330-200s being replaced by A340-300s. The change has increased capacity on the route by 31 seats. Flights are scheduled to take 9 hours and 10 minutes. Flight SA284 is scheduled to leave Johannesburg at 11h25 & land in Mumbai at 00h05. Flight SA285 is scheduled to leave Mumbai at 01h35 and land at OR Tambo at 06h55. Flights take off from Johannesburg's OR Tambo International Airport and land in Mumbai's Chahtrapati Shivaji International Airport. If you're living somewhere else in South Africa other than Johannesburg, then you can fly 1-stop via Johannesburg to Mumbai, from all significant airports in SA: Port Elizabeth, Cape Town, Durban, Bloemfontein. Some of these flights are with SAA all the way and for others the flight from within South Africa to Johannesburg is with South African Airways' codeshare partners, like SA Airlink, SA Express and Mango Airlines. If you want to fly somewhere in India other than Mumbai, then you can still book via South African Airways; but the leg of your trip from Mumbai to somewhere else in India would be with their codeshare partner, Jet Airways. You can fly to Bangalore, Chennai, Delhi, Hyderabad and Trivandrum. 25 Dec 2013. Rating 5/5. "I travelled to India (mumbai) with my neightbour, and we flew with SAA Airlines. We went for a holiday in June, and I must say travelling with SAA airlines was terrific. The price of the ticket was reasonable, the air hostess very calm and polite. I like the facilities we got in the plane, and we landed before our estimated time. The flight wasnt so bumpy, and I enjoyed all the food and beverages. I wouldnt mind travelling again and the toilets was always neat." Annette Singh. 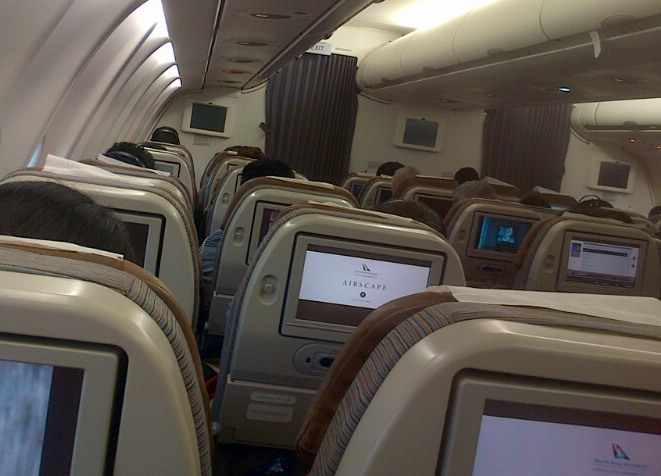 The inside of an SAA Airbus 330-200. By Rubenthree, 5 January 2013. When my husband and I decided to go on pilgrimage to India the obvious choice to take us there was SAA. Both of us are deeply rooted in the country of our birth and are proudly South Africa. We learnt that a local travel agency did block bookings and was therefore cheaper than the others. After much anticipation the day of departure 7 December 2012 arrived. Being vegetarian we made arrangements for vegetarian meals on board. There was no need for this as South African Airways caters for both vegetarian and non vegetarian tastes. We were pleasantly surprised by the meals with an Indian flavor. We checked in and received our boarding pass quite effortlessly. As we boarded the plane we were greeted by cheerful crew members.We had seats close to the front of the plane which meant more legroom- thank God. The overhead compartment was spacious enough to accommodate all our cabin luggage. The safety standards of SAA is on par with giants like Pan American Airways and British Airways. Our flight to India was trouble free. Internally we used Jet Airways from Mumbai which was equally efficient. We had only one hitch with the flight from Kolkota to Mumbai. There was a three hour delay because of the fog at some destinations. 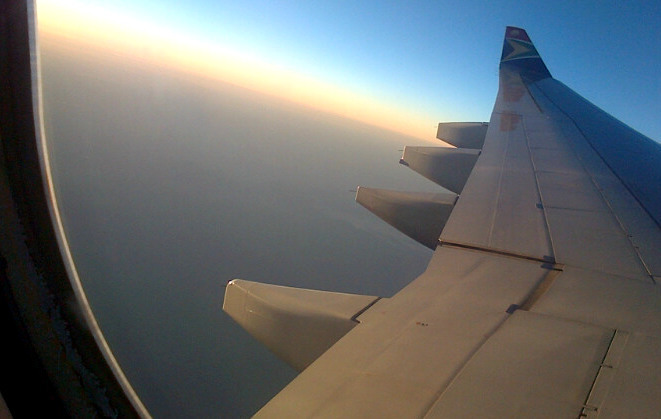 Our return flight from Mumbai to Johannesburg was a 2am on the 31 January 2012. To our surprise there was a section at Mumbai Airport for the exclusive use of SAA passengers. There were about 5 to 6 counters manned by young Indian nationals. The young man at the counter helped us sort out our excess baggage into two bags so we did not have to pay for excess baggage. While standing in the queue to get our boarding passes we were approached by two suit clad young men who asked for our tickets and passports. We reluctantly gave these to them. There men were SAA employees, who gave us temporary boarding passes to speed up the process. We boarded the plane and were seated when the captain announced that there would be a delay because some paper work was not done. This had to be done to legalise the flight. About an hour later he announced that the paperwork was done but incorrectly. We waited another hour before this was sorted out and we were on our way to South Africa. This was the only unpleasant experience because many of us who were taking connecting flights to other parts of South Africa missed our flights. The delicious hot meals and the friendly crew compensated for the delay. There was turbulence as we passed an island on the Indian Ocean. This made the ride a littie bumpy but we had faith that the pilot would get us through and he did. On our arrival at OR Tambo Airport we collected our luggage and went through immigration. We were then assisted with booking for an alternative flight to Ushaka Airport. Although we had economy tickets the kind airport attendant seated us in the business class. We had delicious snacks and extra legroom which was a welcome surprise. The inflight magazine is an excellent publication informing tourists of fashion, politics, places of interest, and places to eat among other things. The magazine , movies, music and other media on offer during international flights leave little room for boredom during long flights. Thank you SAA for adding to the incredible experience that is India. Operating from all of Cape Town, Johannesburg and Durban; Emirates flights to India represent the major competition to SAA. The airline has extensive coverage of India and flights to almost all destinations on the sub-continent are a 1-stop via Dubai from CPT, DUR & JNB. So Emirates have a major edge over SAA flights from cities in South Africa other than Johannesburg to cities in India other than Mumbai : for South African Airways these are 2-stops whereas for Emirates they are 1-stop flights. Othere competitors are Qatar Airways and Etihad; and to a lessor extent Ethiopian Airlines, Kenya Airways and EgyptAir.